If you’re new to veganism and if you have to defend your vegan arguments in discussions and disputes, it helps if you have a good understanding and know a few facts about animals and animal agriculture to blow your “opponent” away with your killer arguments! Documentaries have played a huge role in why I went vegan in the first place and I still enjoy watching them and learning more about the whole system, animal exploitation and the environmental & health effects. 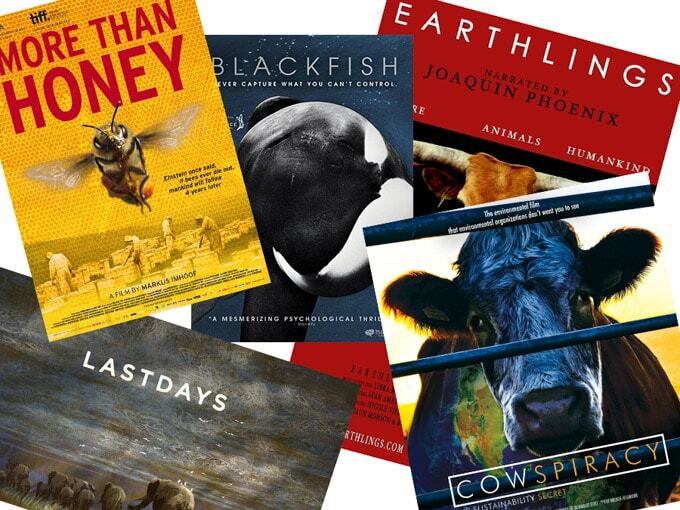 Below I’ve collected my favorite documentaries that deal with animal agriculture, exploitation or the food system in general. 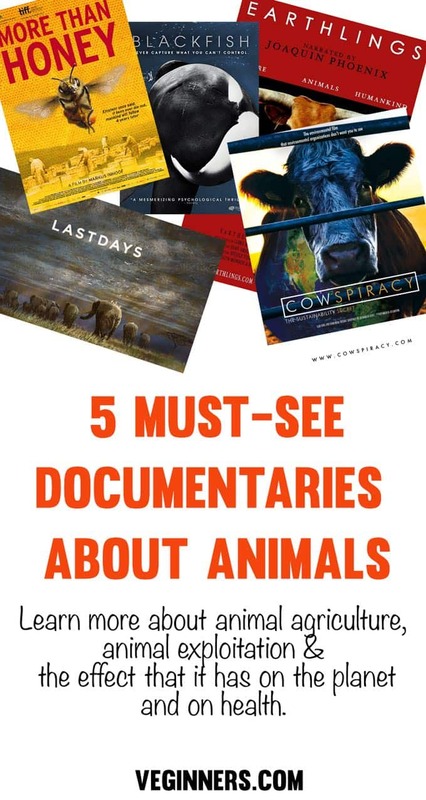 So if you have some time to pass, I can fully recommend watching these :) I bet you wish you’d have seen this documentaries about animals sooner. There’s a good reason why this movie is nicknamed with “The Vegan Maker”. This documentary is amazing, heart-breaking, eye-opening and truly a must-see for every individual living on this planet! You can watch the whole movie on youtube! As Einstein said “If the bee disappeared off the surface of the globe, then man would have only four years of life left. No more bees, no more pollination, no more plants, no more animals, no more man.”, the bees are dying and humankind is to blame. Here’s the website to the movie. Cowspiracy is not only about cows, it’s about how animal agriculture has such an awful effect on the planet as a whole and how this important fact is completely getting ignored by huge environmental organizations. This movie completely changed my mind how I see Greenpeace, Sea Shepherd,.. Watch Cowspiracy on Netflix now! Blackfish is a documentary about captive killer whales and tells the story of Tilikum, an orca held by SeaWorld. You can watch Blackfish on Netflix. This short film (3min) puts the elephant poaching, ivory trafficking and terrorism into relation. An elephant gets killed every 15 minutes, elephants could be extinct in 11 years, so watch the short film and spread the message and don’t buy ivory. I hope you liked the collection. Let me know in the comments if you’ve watched any of these and let me know your favorite documentaries that I have to catch up on! I’m always on the lookout for new ones – so I’d love your recommendations! I’ve been wanting to watch Cowspiracy, but haven’t haven’t gotten around to it yet. I don’t do well with some of these types of films. I watched the trailer for Earthlings some years back. I’m talking just the trailer. I was depressed and in shock for DAYS… I guess I just have a super low tolerance for violence of that kind, but more even just for the thought that so much ill-will towards other beings can reside inside humans sometimes — the latter point just drives me into shock and repulsion. I’ve never heard of the honey one, but that sounds interesting. I completely understand that these documentaries are not for everyone. Especially Earthlings is … just one of a kind. I don’t think I’ll ever have to watch it again, because I’ll never forget those images. However I’m not sure if I’d have adapted a vegan diet if I’d never seen it, so I’m grateful that it exists :) More than honey is really cool too, I never understood what’s so bad about honey until I watched the movie – so it’s very informational too. I watched Earthlings only about 2 months ago, and those images still haunt me :( it is a truly powerful documentary. And I only just realised we can watch Netflix here in Australia (I thought it was only available in the US haha), so Cowspiracy and Blackfish will be next on my list to watch. The honey documentary sounds interesting too, bees are so so important! That’s the point! :) Thanks for your blog. Great list! I’ve seen 3 of them, but will definitely be watching the other two. Thanks Bianca! My daughter is a new vegan and trying to convince us to adapt to a vegan lifestyle as well. She had expressed how much the movie Earthlings had on her decision. She said it will change my entire life. I knew it would be a problem…I struggled to make it through so many other movies. Like every movie where a dog dies…I say oh that’s it…movie’s over! Turn it off!!! So as of those of you who have seen Earthlings know exactly how intense it really is. So while she was at school two days ago, I thought I would give it a shot. With my pug in my lap and tissues ready to go, I turned it on. I made it 17minutes and 54 seconds in. I had all I could handle for that moment. I will pick it back up in another day or so. I cried all day. When I picked her up from school (She is 17) my eyes were so swollen and my nose still congested from crying. Humans are cruel!! Thanks for the suggestion on the new movies to watch. Ignorance is bliss…If more and more people were exposed to these ideas, maybe we wouldn’t be such a cruel world.